Much like the kettlebell row, the kettlebell deadlift is a great way for beginners to get familiarized with kettlebell exercises. It is not a strenuous exercise by any means. However, it can be very effective in working out your back and leg muscles. It offers great scalability with how you can increase or decrease the weight amount without too much stress on your body. You’ll start the exercise by holding the kettlebell handle with both hands while standing straight up. While holding it in front of you, it should rest near the groin area. Keeping your legs straight, you’ll hinge your hips lowering the kettlebell until it reaches the floor. Your back should remain as straight as possible. Afterward, simply hinge at the hips again to return to a standing position. This completes the rep.
We recommend performing 10 reps for a set. 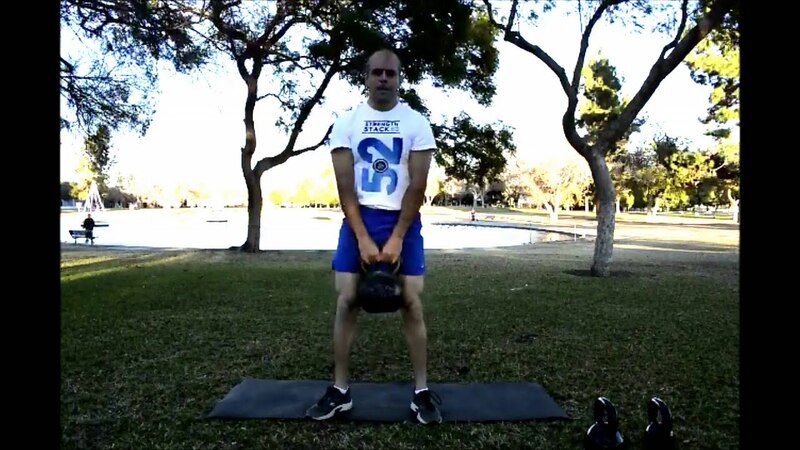 Since this is an easier kettlebell exercise, the choice of how many sets to perform is at your discretion. Anywhere from 1-3 sets would be ideal to incorporate into a 20-minute workout session. Once you are comfortable with the standard kettlebell deadlift, you may want to check out other deadlift variations geared for an intermediate skill level.